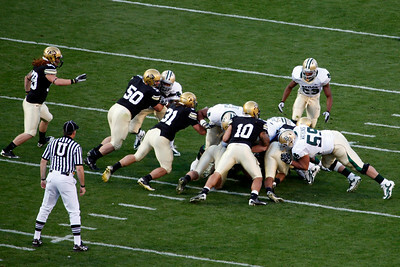 Baylor vs. Colorado on Saturday, October 16, 2010 game at Colorado's Folsom Field in Boulder. 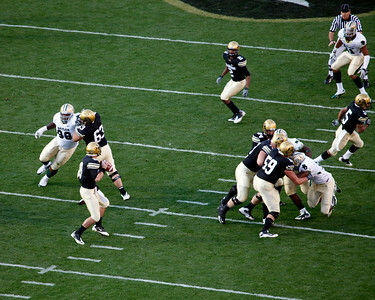 All of the photos were taken from Section 211, Row 70 (the last row) which is about 100 meters from the closest end zone. Hansen (9) can't find anyone open so he decides to run for it. Hansen cuts back - he needs 5 more yards. Hansen gains 5 yards for the first down! Hansen is intercepted by Landor who retruns it to the CU 46. 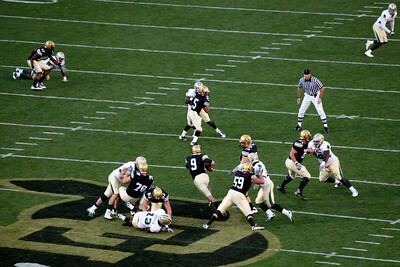 Two plays later - Sipili strips the ball from Finley (23) and Mahnke (12) recovers the fumble for CU. Hansen (9) has Patterson (2) open on 3rd and 5. Patterson takes his eyes off the ball. 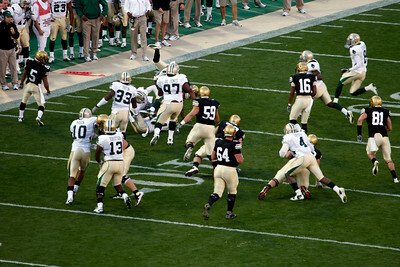 Baylor decides to go for it on 4th and 1. Gannaway takes the handoff from Griffon. Gannaway is met behind the line by Beatty (59). 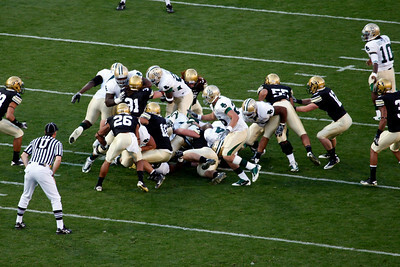 Baylor is stopped short and Colorado takes over on downs at the CU 40. 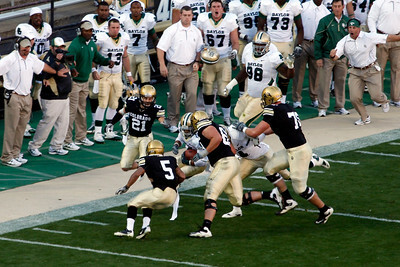 1st and 10 at the CU 40 after stopping Baylor on downs. Hansen is ready to take the snap but bobbles the ball. Hansen mishandles the snap and tries to scoop up the ball. Hansen recovers the ball and is still on his feet. 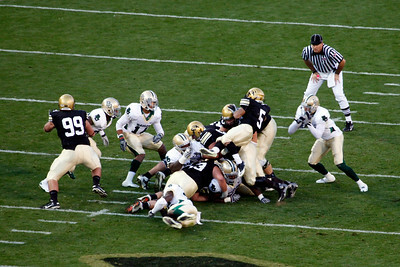 Hansen is tackled for a loss of 2. It's now 2nd and 12. Paul Richardson (80) takes the handoff from Hansen (9) on a reverse. Paul Richardson (80) cuts to the inside, looking for running room. Richardson is running out of daylight. He needs 9 more yards for a first. 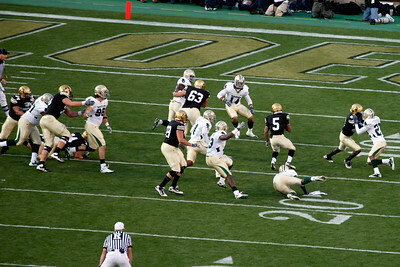 Richardson drags several BU players to the 34 yard line. 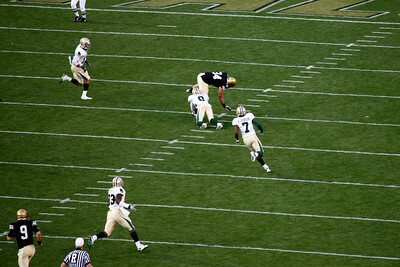 On 4th and one, Rodney Stewart (5) dives over the top for a first down! Tyler Hansen (9) completes another pass, this time to TE Ryan Deehan (34) . Ryan Deehan (34) gains another 7 yards after the catch and is down inside the 20. 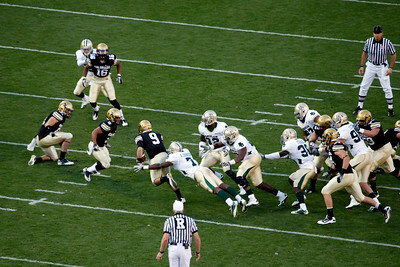 "Speedy" Rodney Stewart (5), listed as 5' 6", 175lb, started from the BU 18. This is one of the most amazing runs you'll ever see! 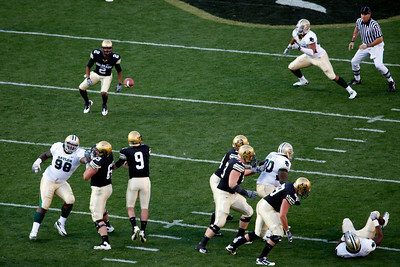 Just count the number of Baylor players who missed Speedy (1). 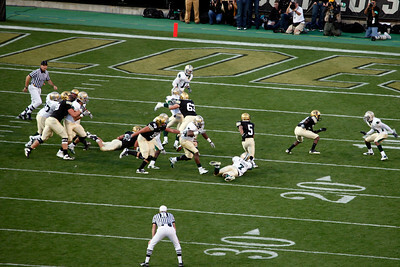 Starting to the right side, Rodney Stewart (5) is looking left but he has three defenders in the way. Should he zig or zag? Looks like Speedy is running right into the arms of BU (3 down).